Tilia Danmark Flora Danica leaf design brooch and earring set. Circa 1960s. Gold coated sterling silver Royal Flora Collection. Estate find. Orla Eggert started the Flora Danica Jewelry Company of Copenhagen in 1953. The Danish company was based in Aarhus until 1974, so this set should date from that time frame. Flora Danica is among the most collectible of botanical style European jewelry. The inspiration for the Royal Flora Collection was found in the Danish ditch edges, garden, and forests. Tilia is the name of a species of tree, many people think it is the name of the artist. Danmark is Danish for Denmark. 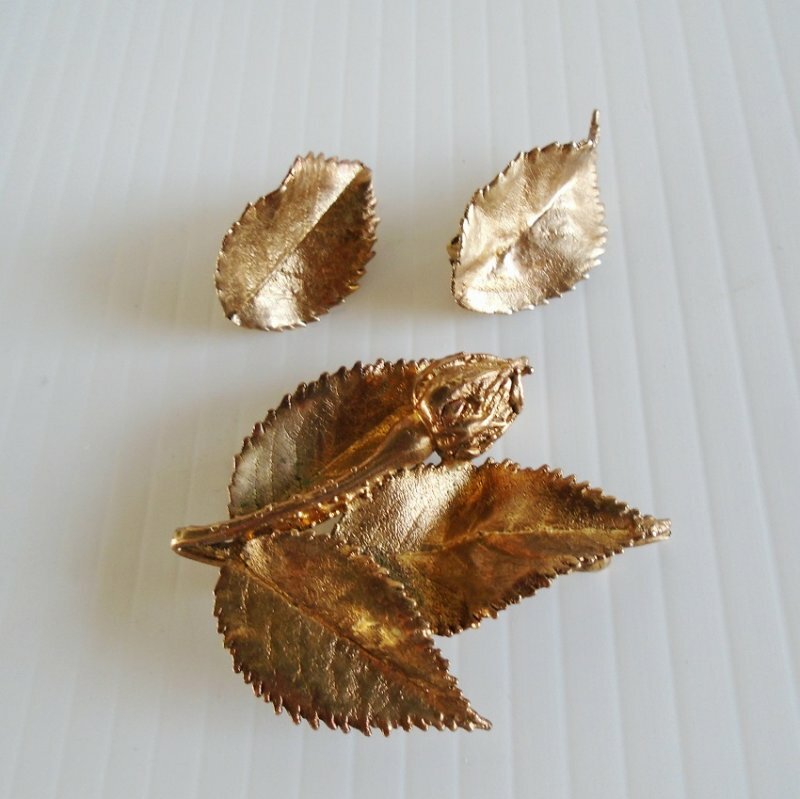 The jewelry is made with genuine leaves coated in sterling silver and then coated with 18k - 24k gold gilding. SPECIAL NOTE - I have also seen a notation that the jewelry was produced in Sterling 925 silver and 18ct gold plated. I do not know which is correct. The brooch measures about 2 inches and features a rose bud laying on the leaf. The earrings are about 1 inch long. Each of the three pieces are unique, made from real leaves. Because of that, each piece may have the very slightest difference but not to the point that is easily noticed. All three pieces of the set are marked on the back with "Tilia Danmark Sterling Solv". The pin closure is on the back and has a secure rollover pin. It can be pinned and worn in any direction. The earrings are clip-ons. I have seen the pin listed separately, and I've seen the earrings listed separately. I have never seen the complete set in one listing. The package will be mailed with insurance and signature confirmation required at the time of delivery. Since these two safeguards are for the benefit of both of us, I split those costs with the buyer. Buyer to pay USPS First Class Mail delivery charges of $7.99. Shipping is from Arizona. Every January the postal service increases shipping charges. Sellers have already been notified that this January the cost of shipping will increase between 6% and 10%. I try to absorb some of the new charges but that's getting harder with each increase. International shipping charges will also take a tremendous leap. International shipping will now depend on the country. Buyer must contact seller for international shipping charges before making a purchase. Seller reserves the right to void any international transactions where contact has not been made prior to purchasing.